Validation and optimization of a potentially novel AR-V7 antibody (Clone RM7) for immunohistochemistry. (A) Western blot (long exposure) of AR-V7–positive (LNCaP95, 22Rv1, and VCaP) and –negative (LNCaP, PC3, and DU145) PC cell lines using a novel recombinant rabbit monoclonal anti–AR-V7 antibody (Clone RM7) and a previously reported anti–AR-V7 antibody (EPR15656). All cell lines except LNCaP95 (10% charcoal-stripped serum) were grown in 10% FBS. (B) Immunoprecipitation of AR-V7 from M12–cumate-inducible AR-V7 cells using the same concentration of AR-V7 antibodies and Western blot performed with AR N-terminal domain (AR-NTD) antibody. 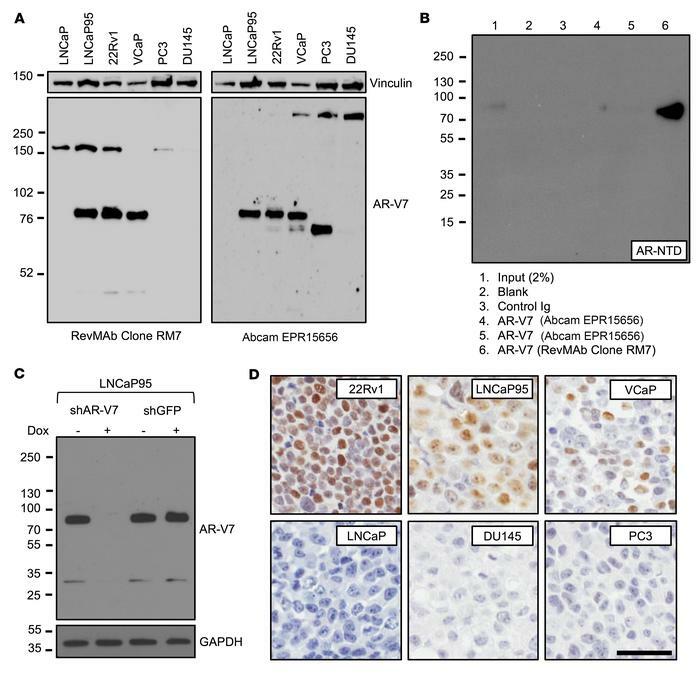 (C) LNCaP95 cells with doxycycline-inducible shRNA to AR-V7 were treated with (or without) doxycycline and Western blot performed with AR-V7 antibody (RM7). (D) Micrographs of AR-V7 detection by IHC using AR-V7 antibody (RM7) in cell line pellets positive (22Rv1, LNCaP95, and VCaP) and negative (LNCaP, DU145, and PC3) for AR-V7 (original magnification, ×200; scale bar: 50 μm).